We had a brilliant trip in Munich, but weren’t done with Germany yet, no! A couple of our friends organised a new year’s trip to Berlin and we agreed to go along! On our first evening, we knew we were going to like this city. 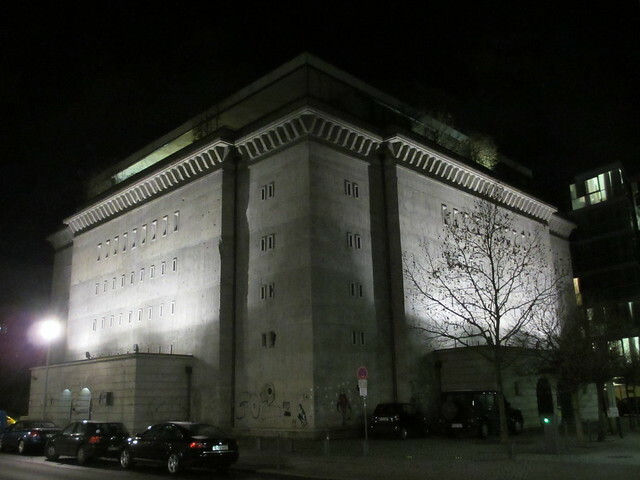 Our hotel was next to a WWII bunker. 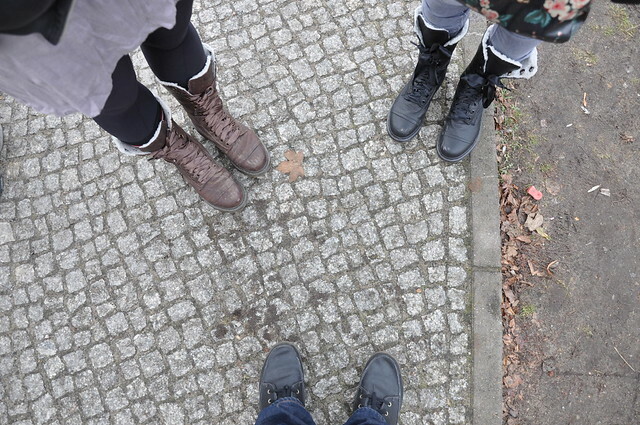 On our first day, we decided to go on one of the famous walking tours they have in Berlin. We were anxious about an expected 4 hour length, but it was worth every minute. This post will just talk about some of the highlights. 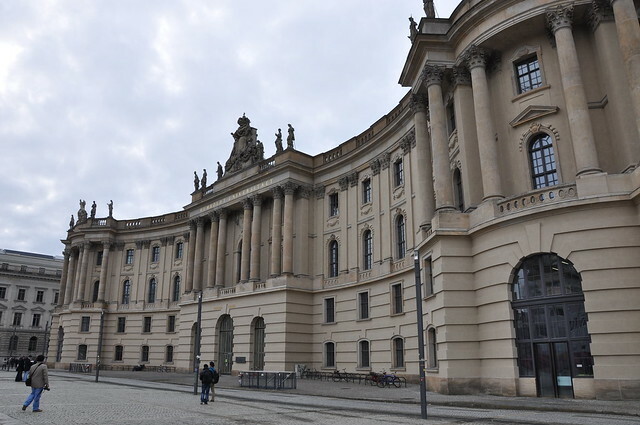 One was visiting Humbolt University buildings where, in 1933, an estimated 20,000 books were burned because their content’s were against the the Nazi German ideals of the time. The books were burnt because of their content, or their author’s background, were liberal, communist, pacifist, Jewish, gay or any number of other ‘non Nazi’ concepts. There’s a memorial to this burning through a glass panel looking into an underground white room of empty shelves for 20,000 books. There’s also a plaque with a quote written 99 years before Hitler by Heinrich Heine – “That was only a prelude; where they burn books, they ultimately burn people”. Very apt. 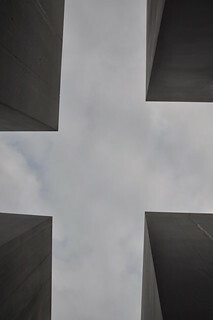 We visited Berlin’s War Memorial, which used to be a memorial to WWI and WWII but is now a memorial to all wars. 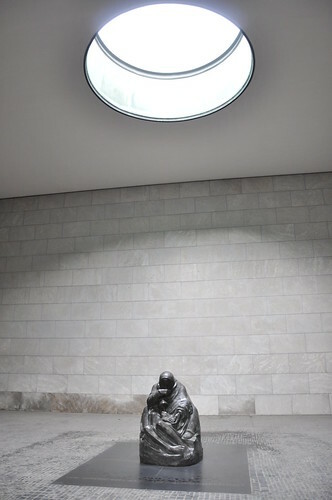 The open ceiling above the sculpture means when it rains, it falls like tears down the sculpture and when it snows, it lands like a cold blanket over the weeping mother’s shoulders. Beautiful. 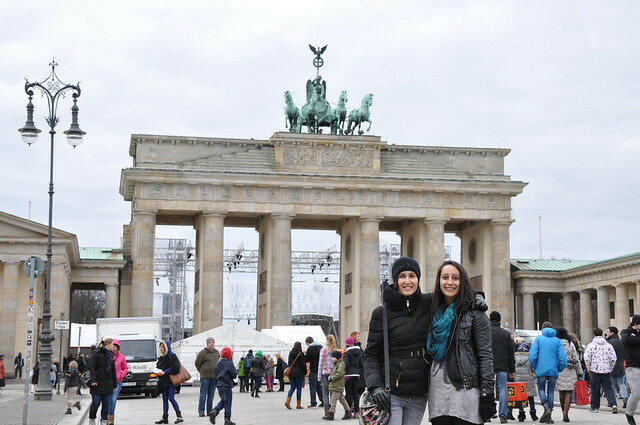 We walked under the 18th century Brandenburg Gate, which was all stage and cables for the New Year’s Eve festivities. It was commissioned by one of the early Prussian Kings as a sign of peace. In case you don’t know, Prussia was a German kingdom which consisted of Belgium, Denmark, Germany, Lithuania, Poland and part of Russia. Unrelated to the gate, but still interesting, the last Prussian king was 29 year old William II, grandson to Queen Victoria. He was responsible for triggering World War I in 1914 and when he was forced to abdicate in 1918, the war finished shortly after. 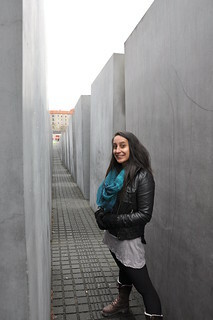 We visited the iconic Jewish Holocaust memorial. Of the 11 million people that were killed in the holocaust, 6 million were Jewish. 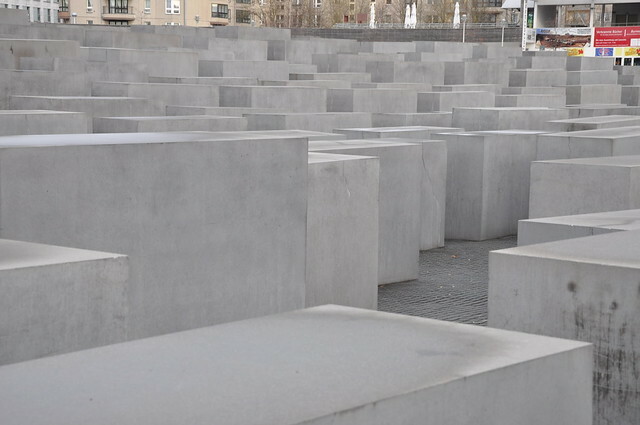 The memorial’s official name is “The Memorial to the Murdered Jews of Europe”. Yikes. I went to a Jewish primary school back in NZ (no, my family and I are not Jewish) so I was quite pensive about the memorial. Artistically, it is impressive and imposing. And covered in tourists. I really enjoyed the work and would recommend anyone go visit it. 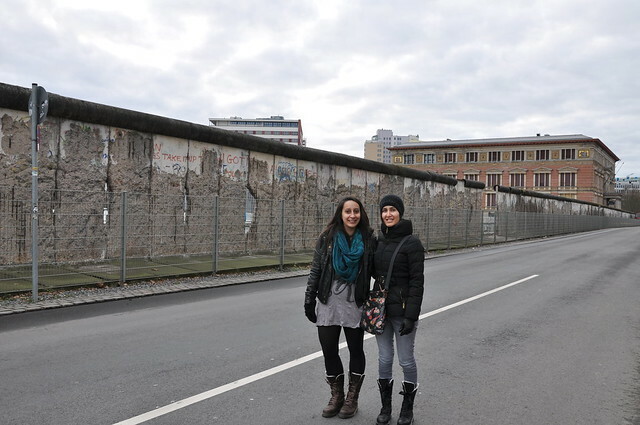 We wandered down to see our first stretch of the Berlin wall. We learnt about how Germany was split into East and West after WWII, where the Allies governed the west and the Soviets the east. Berlin was split in half as well, though West Berlin was surrounded by East Germany and East Berlin. During the 1950’s, the Soviets controlled most of Eastern Europe and 3.5 million people chose to migrate from East Germany to West Germany via Berlin. To combat this, in 1961 the Soviets decided to build a wall that completely cut off West Berlin from the East. The West was surrounded, splitting a city and the people inside firmly apart. The wall was guarded by armed soldiers and anyone attempting to cross the wall was killed on sight. Over 600 people died during the 28 years the wall was up. The only place people could legally cross, if they had a work permit or similar, were called checkpoints, and these were managed by different forces. The most famous one is Checkpoint Charlie which was managed by the U.S. It was the last checkpoint to open its gates to allow East Berliners to cross over to West Berlin when the wall finally fell in 1981. 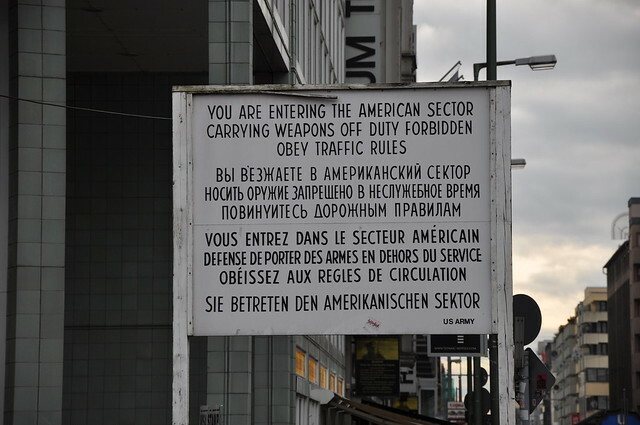 A memorial has been left at Checkpoint Charlie – the original sign warning people they are entering West Berlin, a US territory, and a new sign with 2 images on it. 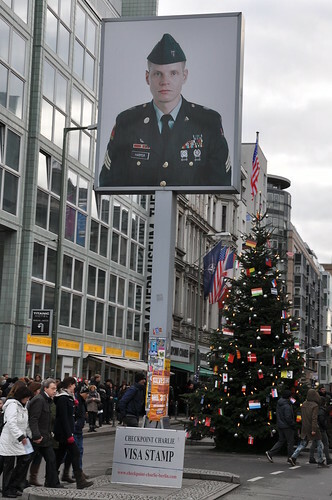 One of a US soldier facing toward East Berlin and one of a Russian soldier facing West Berlin, as they would’ve done when they were stationed at Checkpoint Charlie. Those are the key highlights from the tour and we learnt so much about the city, how it was affected by both World Wars and how it is developing and growing as a European leader for the future. The tour did take 4 hours but it was all interesting – I would highly recommend it to anyone who visits. The next day, we went to visit a WWII museum, Topology of Terror, that we went past on the walking tour. The museum is built next to the foundations of the SS building. The SS were the ‘Protection Squadron’ that were the largest and most powerful organisation in the Third Reich. They were also responsible for the worst atrocities against humanity during WWII. The building was largely destroyed by Allied bombing in 1945 and the ruins demolished after the war. 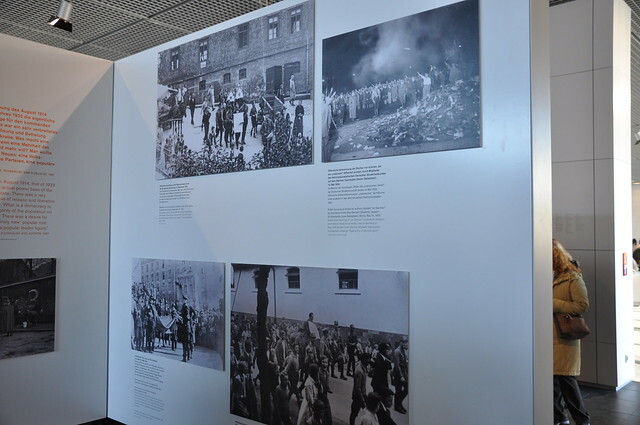 The permanent exhibition was titled ‘1933 – 1945 Between Propaganda and Terror’ – a chronologically ordered set of informative boards starting from 30 January 1933 when Hitler became the Chancellor of Germany. The first 6 years before WWII were the most interesting for us, as it was about how Hitler slowly gained dictator-like powers over Germany, how he’d imprisoned political opponents in Dachau concentration camp within a month of coming to power, how his popularity grew in Germany as his propaganda machine influenced public opinion. By May 1933, book burning had already begun and people were publicly shamed for criticizing the Nazi regime, for not allowing their school students to say ‘Heil Hitler’ or for courting a Jew. This picture below really caught our eye, titled ‘Conformity and refusal’. The crowd salutes Hitler after his address at the launch of a Germany Navy training ship in 1936. 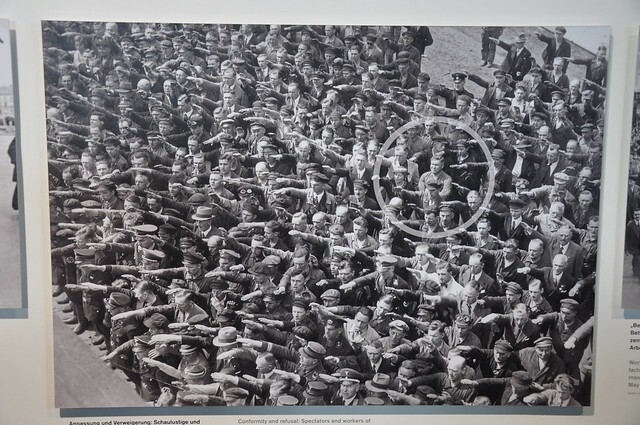 One man (circled) refuses to salute. The caption says they don’t know what happened to this man, but some other accounts of people who didn’t salute were cited warnings, or publicly shamed, or even sent to a concentration camp like Dachau. We were shocked to learn that 1000’s of people died in concentration camps before WWII even started, and most of them were German. 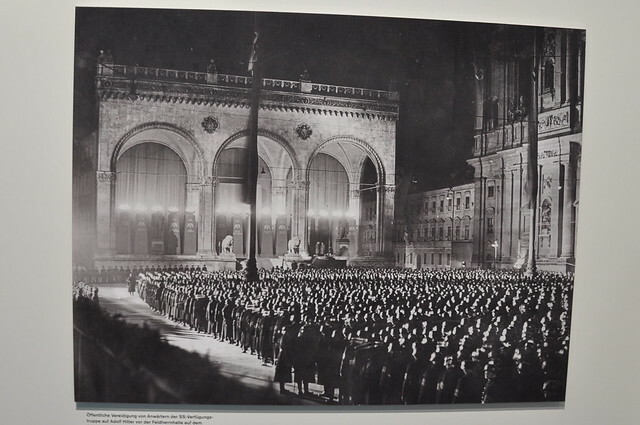 This photo, from 1938, is outside Munich’s Residenz that Rob and I had visited on our first trip to Munich. It stuck out for us because we knew exactly where they were. These are candidates for the SS Deployment Force swearing allegiance to Adolf Hitler in front of Hitler and Himmler. There were dozens and dozens of images and we learnt so much about the Nazi regime. Half of the exhibition was set during WWII and outlined the different groups of people who were persecuted by the Nazis and all the countries that were invaded by the Nazis. Terrible stuff. But this image below really stuck out. 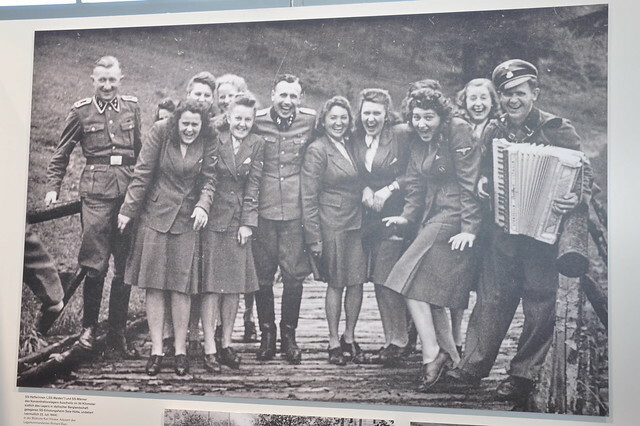 These SS men and women from Auschwitz concentration camp are at an SS retreat south of the camp in the mountains 30 km away. What a captivating image, contrasting all the atrocities that were captured in the WWII section of the exhibition. The last part of the exhibition talked about the end of the war and the trials of various leaders, concentration camp staff (like the people above) and others. It wasn’t an optimistic finish – the trials were patchy and incomplete. Some people will never be charged because there was so much fear in the regime that they were as likely to be sent to a camp at a Jew or Gypsy. They couldn’t say ‘no’. 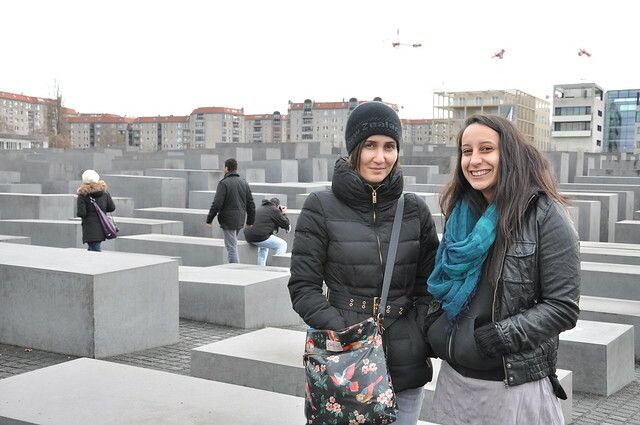 It was a full 2 days and we learnt so much about Germany and Berlin’s history. A long, heavy and complicated history. But we were thrilled to learn. Enough of the gloomy stuff! 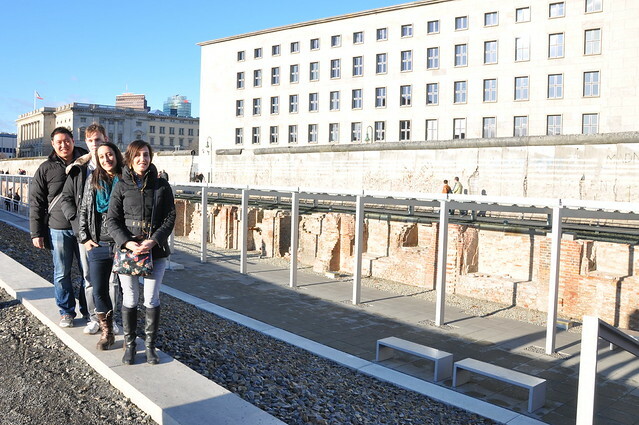 Berlin is an amazing city and a lot of fun things to do too!